Bart’s been quite concerned for a while about the number of snakes we are tracking on the project, obviously the more snakes tracked the more data we have to play with. We’ve been stuck at 3 for quite a while now….but all that changed yesterday morning! The day started as just another day! 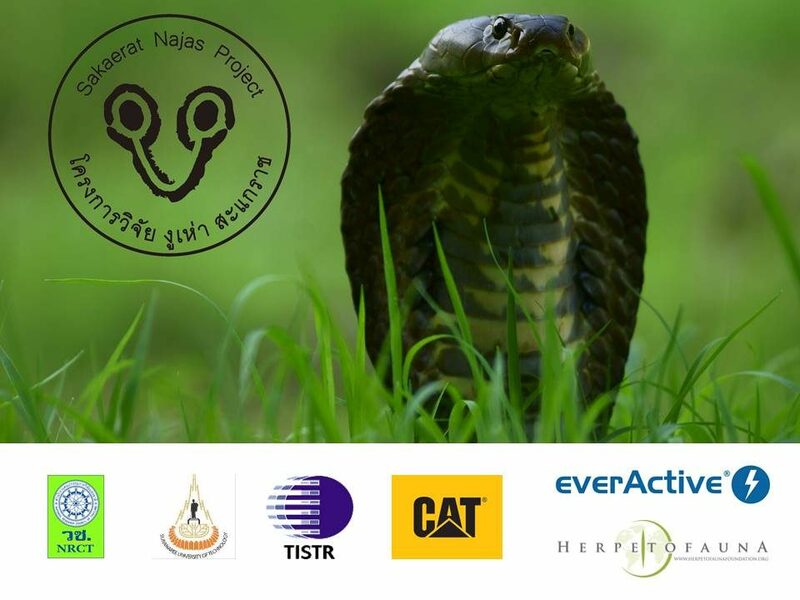 If ever there is such a thing on the Sakaerat Conservation and Snake Education Team. It looked as though it was to be a busy one. First we had to check our plots in which we hope to catch more Naja’s for our common cobra project. Then we had to check both Nasi003 and Nasi009 in the outlying villages, before back to the station and off into the dry evergreen forest to track Naka012. All before lunch, as the afternoon would be taken up by completing the construction of a third plot that we are building in a streambed near to the station. The morning was going well the two Nasi’s were behaving, no big moves to take up our time with long tracks. A small repair job on one of the snake traps a mammal had chewed its way through the previous day, we were on schedule. Heading back, just 200m from the station I noticed a strange looking stick by the side of the road. As we approached I noticed the stick was also hissing and hooding at some unseen offending incident or individual further along the road ahead of us. Naja kaouthia! Curtis slammed on the bike brakes as he and I exploded off the bike, frantically trying to call Bart and assemble tracking equipment to verify it was a new snake. Sure enough we got no signal from the kaouthia. Now past the snake and in its eye line the snake’s attention was well and truly on us. For three or four minutes it hooded at us before becoming bored watching the two over excited buffoons fumble about with equipment, and started to move slowly into the forest. Curtis took off in hot pursuit following the snake into the forest which eventually hid under a pile of cut vegetation by the side of the road. At that moment, Bart (who had been woken from a deep slumber by our call) came sprinting round the corner, shirt unbuttoned, snake tongs in hand like a herpetological superhero! We got the snake surrounded and Bart moved in for the capture. The snake hooded and hissed and struck out at the snake tongs but was eventually subdued without incident. The rest of the day consisted of snake processing and surgery. Turns out that this isn’t this snakes 1st run in with the snake team. Our kaouthia is non other than NAKA003, a snake which was caught FOUR TIMES in 2013. The transmitter was implanted, and the snake was recovered and ready for release within a few hours. At 5 pm the snake was released about 20m from its capture site a little further into the forest away from the road. As he was emptied out the box it seems he had a score to settle with his captor and took a disliking to Bart. For the next 30 minutes he hooded and hissed at him (ignoring the other team members). Eventually however with a little encouragement he slinked off back into the forest. So after a hectic day we officially got our 4th snake! Looking at his previous capture data it seems he has a healthy sized home range, though most of his captures have been around the station. However, he hasn’t been captured for almost two years to the day. It does make you wonder where he has been, how he has avoided detection for so long, and what has led to him being so exposed and captured now? We will keep you posted! Snake is male 1540 mm long and 732 g heavy. Here are some pictures from release.